I love romance novels with really big emotions. When I first created an author website and was searching for a tagline, I played around with big stories with big emotions as a description for my writing. And even though I ultimately settled on different words, if you’ve read my stories you’ll know that I’m very fond of putting large emotional obstacles in my characters’ paths! 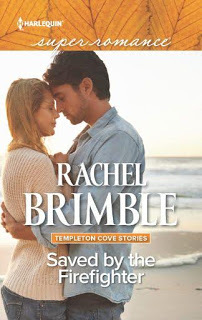 So when I read the back cover copy of Rachel Brimble’s new book, Saved by the Firefighter, I was intrigued. Because oh my goodness Rachel didn’t just take on big emotions, she wrote a book about grief! The book opens with the heroine, Izzy, totally frozen in grief after the death of her brother. So she sent me a copy and I’m really glad I put my hand up. It’s a great story and I think Rachel did something pretty extraordinary in it. She caught a lot of the strange aspects of grief that no one really warned me about when I first lost someone I loved. For example, Izzy feels numb at the beginning of the book. And lost, like she’s wandering around in a fog. I think most of us can relate to that, but later on in the story, she gets very indecisive. And as a reader that can feel a little annoying, but having been through grief a couple times now? I get it! Decisions can feel impossible because what if there are dire consequences? What if, by deciding something, you open yourself up to more emotional pain, when you are staggering around under the weight of what you’re carrying already? Poor Trent, the beyond-gorgeous firefighter who loves her. He so wants to be the one to make it all better for her, but that’s another tricky thing about grief. Ultimately, we all have to find our own way through it. Someone else can’t really fix it for us. They can help, and Trent does, and Izzy’s best friend Kate does, but they can’t make it all better. Only Izzy can figure that out. She takes that journey in her own way, with stops and starts, just like any of us would. And Trent has his own path too, to learn to step back, to not rush to the rescue every time, and to confront his own past, his own grief, which has been driving him for years. It’s a big journey, but Trent and Izzy have some great chemistry along the way, which adds spice to this sweet story. Trent is lovely, I’ll confess I had a bit of a crush on him, and as Izzy makes her way through her grief, I found myself cheering her on more and more. Plus, the hunky firefighter calendar Izzy is working on for charity adds a cute and uplifting note. By the end of the book, I was so happy for Trent and Izzy, and I really wanted one of those calendars! To purchase Saved by the Firefighter, here are a few links. Thanks for joining me on my blog today!